Hosting the Twitter account for your news organization is like spinning out a monologue. What are we reporting? What are people talking about? What do we know? What do we want to know? So how should you handle the account for your news organization? Here’s the guide we use at NPR, but it can apply to smaller member station accounts as well. Our voice is authoritative and smart. But it can also be fun and self aware. Talk with the audience — don’t talk at the audience. @lamarshall Once the chamber goes into recess, the House cameras are turned off. Officially, they are still in recess. Look at your top-performing (or even low-performing) stories and identify opportunities to tell those to your Twitter audience. Assume people may not click on the link. Tweet an image from the story, or use quotes and fact lists to add context. Make it shareable. Check which terms are trending on Google Trends and what hashtags are making the rounds on Twitter (you can find trending hashtags and keywords on the left side of the main Twitter page). If any of your stories match trending words or hashtags, use them in tweets. Tweet a story again if need be. Come at it from a different angle or highlight a part that people are talking about on Twitter. But never try to hijack a popular hashtag by just plopping it at the end of an unrelated story. It is obvious and looks bad. If there is a piece of news worth getting out immediately, tweet it! Let people know you will have more details later, but get the confirmed facts out there now. Tweet again (you can respond to previous tweets) when you have a story link. 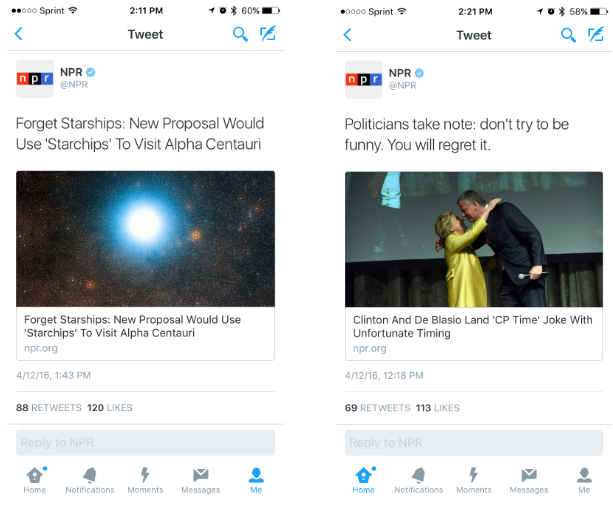 In the examples below, we used NPR’s in-house quotable and factlist tools to pack a lot of information into one tweet. Look for opportunities to retweet your reporters, related station accounts and official sources. Remember that RT’ing is reporting. Verify information before retweeting it. Our preference, more often than not, is to use a quote tweet to add context and additional information. Be considerate of those you RT or tag in tweets. While there is the expectation that all our tweets are public – whether by a reporter, editor, producer or other employee – be mindful of those that work in your organization but are not directly in the public eye and likely are not expecting their tweet to go out widely. Stick to retweeting those who are covering the news or talking specifically about news they have direct knowledge about. Don’t RT someone’s snarky comment on a debate, for instance, just because you are also following and reporting on the debate. Check out your most recent tweets to see how people are reacting. Respond if there are conversations worth having or questions you can easily answer. A little goes a long way, so even saying “Thanks!” to someone or liking a tweet can have an impact. As in the example below, if you see an opportunity to engage using some personal insight into a particular topic, do it! People love that connection that tells them that you aren’t a robot. 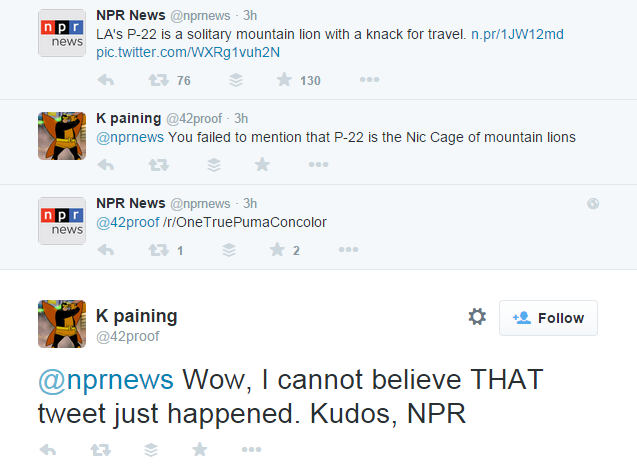 The response is a joke that involves a little knowledge of Nic Cage’s mythical status among the Reddit community, and now this NPR fan just had a great interaction with us. Also, there are often times where we might receive inflammatory tweets or tweets that call our reporting into question. One of the most common forms is, “NPR, why aren’t you reporting on X?” Truth is, we often are but they just haven’t seen it. When possible, send a link. For other negative tweets, the best response is generally no response at all. But there will be times where you want to correct false information or point someone in the direction of other reporting. Correct without being condescending, without attacking and without losing the voice and composure your audience expects. Errors are inevitable and correcting them when we notice one, whether factual or just a typo, is paramount to maintaining trust with our audience. If you notice a mistake in a tweet, fix it immediately. Unless there are legal or safety concerns, never delete tweets because of an error or typo. One of the best methods is to quote tweet the original with the correction (following our standard corrections guidelines), and then re-write the tweet as intended and tweet again. If the error was in a factlist or quotable, re-create it with the corrected information. If a follower pointed out the error, reply to and thank them and point them to the correction if possible. Mobile is where a lot of people experience Twitter. When you tweet text and a link (like NPR’s auto-tweets), they show up like the example seen below on the left. As you can see, because of the auto-populating Twitter card with the image, you get the headline twice. So if you were manually tweeting this, you might write a tweet that pairs with the headline and include the link only (so it pulls in the Twittercard), like the example on the right. Don’t write a tweet that is also the headline but only include the link – otherwise you will get a tweet that repeats itself. Remember, be as human as possible. If you are tweeting out a long string of replies or a tweetstorm, do a reset. In the case of Twitter, that means giving people the link again whenever possible if you are talking about a specific story. Whenever you have the character count left, add the link. Assume people might not see that first tweet, and do what you can to grab their attention in what would be the “middle” of you telling the story. Steve Mullis is an engagement editor at NPR. A version of this guide originally appeared on NPR’s Social Media Desk Tumblr.